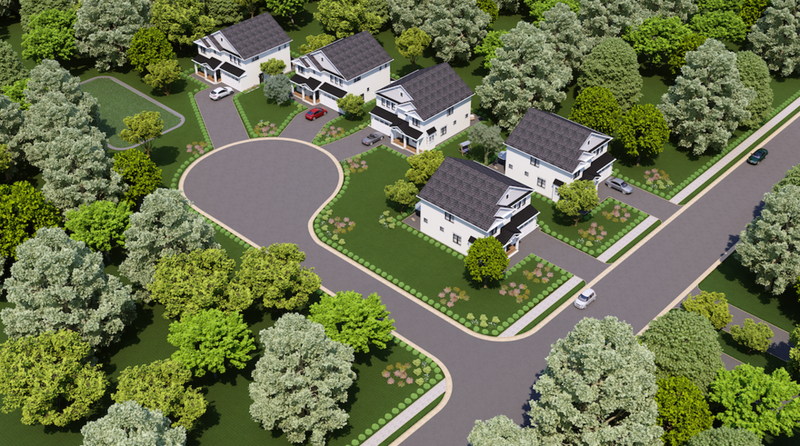 Maple Grove, a petite subdivision nestled next to Sleepy Hollow, is designed for five semi-custom homes. Lined with maple trees for a picturesque changing of the seasons, the subdivision is ideally located in close proximity to restaurants and shopping. This impeccable new construction is the first of five available lots. Demonstrating the timeless and luxury-focused aesthetic of Snead Homes, the new build features a seamless floor plan immersed in natural light, nine foot ceilings, and hardwood flooring. A chef’s kitchen, stainless steel appliances, oversized eat-in granite island, and shaker style overlay maple cabinetry opens into the great room complete with 42” gas fireplace with stone hearth. The first floor also features a formal dining room, living room, as well as an office with gorgeous oversized windows. Boasting five bedrooms, four and a half baths, this home has been manicured with a lengthy list of top-of-the-line finishes. Thoughtful finishes throughout, like the crown moldings, batten board, Flagstone walkway, Red Oakwood staircase, sand-in-place real hardwood, mudroom locker cubbies and built-in upstairs reading nook, all add to the unique and refined character of this stunning new home. Maple Grove, a petite subdivision nestled next to Sleepy Hollow, is designed for five semi-custom homes. Lined with maple trees for a picturesque changing of the seasons, the subdivision is ideally located in close proximity to restaurants and shopping. Under ten miles to Tysons Corner, Not even seven miles from the Pentagon. Under ten miles to the center of the Capital and under eight to Ronald Reagan Airport! Centrally located for all commuters. This new community from Snead Homes will be not even seven minutes from Maple Grove, in a quiet cul de sac off Lee Highway on Rosemary Lane. With five lots available, you can chose from the same two beautiful floor plans from Maple Grove and customize to your liking. Inquire today for pricing and finishing details. Delivery estimated for Spring of 2018!